In 2017, the country that received the second most economic aid was Colombia. The United States gave them a little over $212 million. Why give Colombia this much aid? To start, Colombia has finally made peace with FARC (Revolutionary Armed Forces of Colombia), a militant group that has run rampant throughout the country for decades. The destruction has caused approximately five million people to be displaced throughout the country. The displaced people find it very difficult to find work, which creates barriers to obtaining food and shelter. In fact, 24% percent of all displaced children suffer from malnutrition. Therefore, the United States has sent approximately $67 million in agricultural support to the nation of Columbia (USAID). Not only are the people in need of food, but the newfound peace is allowing the country to move forward into a period of what they hope will be prosperity. In response, the United States has given a little over $90 million for infrastructure, security, and to the government for the betterment of society. In this instance, United States money is being spent on the advancement of a growing society, one that the United States could invest in and possible trade even more with in the future. However, although providing aid to Governments is helpful, it also does not provide a specific sector where the Government is using the funds. We have seen many instances in which government corruption involving money has slowed the development of a nation. Still to this day bribery and corruption haunt the politics of Colombia and thus, sending tens of millions in aid to the Government, instead of specific sectors, might not be the best use of funds. Furthermore, for decades now, the United States has had trouble with Colombia over narcotics. Although FARC never grew the coca plant or made the drugs, to make money and to purchase weapons, they were responsible for trafficking large quantities of them. With peace between FARC and the Colombian Government, along with the aid package being sent by the US government, the United States hopes that the drug operations still going on in Colombia, can be severely hindered. Therefore, although the peace is monumentally helping Colombia as a nation, it could be fruitful to United States as well. The large sum of aid sent to Colombia, in comparison to other South American nation, also points to the United States receiving some economic or political benefit. For example, in times of war, the FARC would attack oil extraction centers around Colombia, in whose companies the United States invested heavily. For this reason, the U.S.’s main motive of sending aid can be seen through the lens of protecting economic interests abroad, therefore providing a duel benefit. United States aid is not just meant for the larger countries of South America, but for the smaller ones of Central America as well. One of the biggest issues occurring in Central America is the literacy rates of some the countries. For example, the average global literacy rate is 84%, and as of 2015, three Central American and Caribbean countries are still below the global average (IndexMundi). Nicaragua has a literacy rate of 83%, Guatemala has a literacy rate of 82%, and Haiti has a literacy rate of 61%. In order for these economies to prosper and a middle class to be build, literacy and education levels must improve. To this point, in Nicaragua, out of approximately $26 million in aid, $4 million went to education, the third most of any department. In Guatemala, 200 million dollars was spent on aid, the third most of any Latin American country, and 19.5 million of that was spent on education. Lastly in Haiti, where the US sent 250 million dollars, the most in any Latin American country, 25 million was spent on education, where the literacy rates are among the worst in the world (USAID). With these aid packages, the US is not thinking of immediate economic and social advancements, as with Colombia, but is focusing on long-term goals for each of the countries. As a long term goal, this ould be very helpful to the United States. By provided aid meant to improve the nations’ educational systems, the United States is hoping they can develop more industry over the long term. As a developing country with low labor costs, opportunities for investment would be plentiful. Therefore, by expanding and improving education in these countries, the United States is hoping for education growth, so they can advance their economy. Once again, the benefits seem to be duel in nature. Overall, in each of these case studies, aid is funneled into the sectors of each country that need it most. Although, in cases like Colombia, money sent to the government can be vague and many times used inadequately, aid to Latin America countries is, for the most part, used in service of the betterment of the country. However, because the U.S. has many economic and geopolitical interests in Latin America, one can also see the benefit the U.S can obtain. In Colombia, peace with the FARC allows economic interests to operate with less problems, while also points the focus away from the terror they caused to the cartels and drug operations within the country. Moreover, by increasing education levels, one increases the development for industry in developing nations, thus increasing the opportunity of foreign-direct investments. In this way, giving aid to countries is much like trading with them, only with a more covert economic or political goal, and one that, just like trade, might not be fair in the long-run for these developing nations. US AID. (16 Mar. 2018). "FAE Foreign Aid Explorer". EADS. Index Mundi. (1 Jan. 2018). 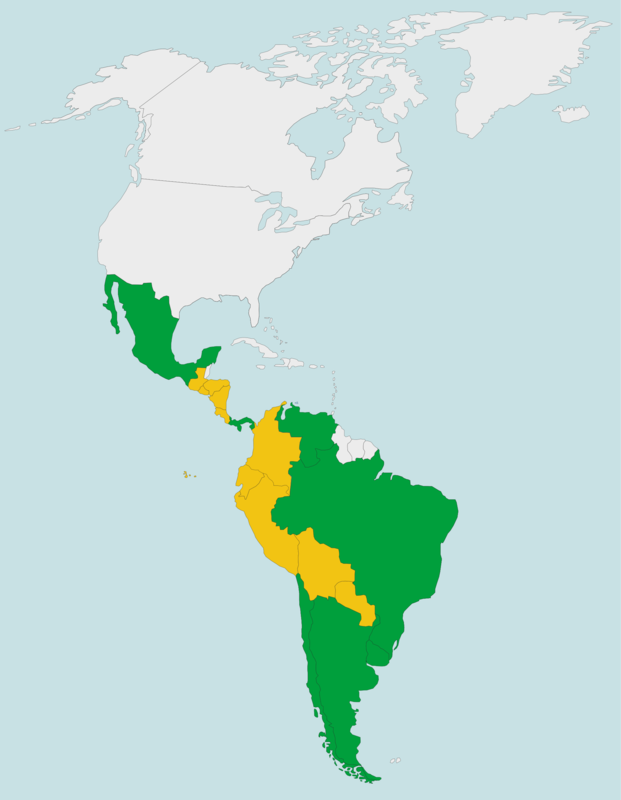 "Literacy - South America". Index Mundi. Meyer, Amelia. (2010). "Brazil Environmental Issues". This course focuses on the history, politics, and legitimacy of US policy towards Latin America. The course is taught by Professor Scott Morgenstern. The contributing articles are written by students who took the course in Spring '18.